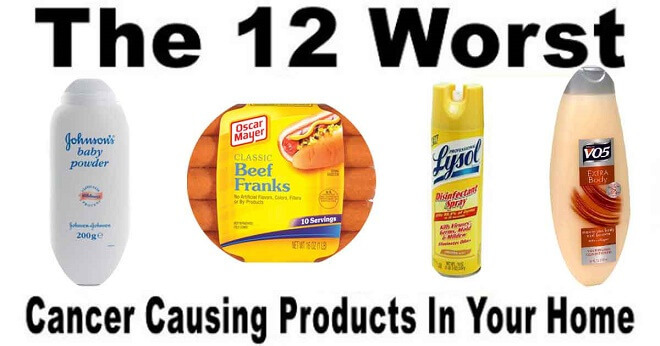 Among many other cancer causing products commonly found in the home, this dirty dozen list has made it to the Hall of Shame. The Cancer Prevention Coalition (CPC) and Ralph Nader have released a ?Dirty Dozen? list of consumer products used in most American homes, and manufactured by giant U.S. corporations. However, just as many toxic chemicals can be found in your home as well. The ?Dirty Dozen? products contain a wide-range of carcinogenic and other toxic ingredients and contaminants to which most of us are exposed daily. When the coating breaks down it releases a variety of toxic particles and fluoride-based gasses, many of which are carcinogenic (cancer causing). Instead of toxic non-stick cookware, purchase glass or ceramic pots and pans that don?t release harmful fumes. Talc in it is labeled, and it can lead to lung irritations and ovarian cancer. Researchers detailed findings in The Lancelet journal that a majority of ovarian tumors had particles of talc deeply embedded in them. That study was followed by another published in 1982 in the journal Cancer, which provided supporting research linking the powder and ovarian cancer. Since then, more than 20 studies showed similar cause-effect relationships. Most recent is a June 2013 study published by the journal Cancer Prevention Research. Researchers from Brigham and Women?s Hospital reviewed data from eight research papers that involved nearly 2,000 women. Their analysis showed an increased risk of ovarian cancer of between 20 and 30 percent for women who used talcum powder for intimate personal hygiene. Many studies have linked Bisphenol A to having adverse health effects. In 2010 the FDA changed their stance on the chemical, expressing ?some concern? over its effects on the brain, behavior and prostate glands in fetuses, babies, and young children. Instead of using disposable plastic water bottles, opt for reusable metal or glass ones. The same goes for food containers. Not only are you saving the environment, but you?re keeping your body safe as well. Cancers- One study showed that common air fresheners contain a ?considerable? amount of formaldehyde, which the United States classifies as a ?known human carcinogen.? Overexposure to air fresheners has been linked to cancers of the nose and throat. To use essential oils as an?air freshener, add 10 to 15 drops of essential oil into a spray bottle with approximately one cup of distilled water. Spray this around the house as your would a conventional air freshener. Hormone disruptors- Studies found that these cleaning products include substances such as parabens, triclosan, phthalates, and BPA. Unfortunately, the innocent looking toothpaste found in a regular household holds many scary secrets! With ingredients such as Saccharin and Fluoride, both carcinogens (cancer causing), toothpaste is not something you would want anywhere near your mouth. Saccharin- ?an artificial sweetener, mentioned above. It is said to be approximately 350 times sweeter than sugar. Considered to be a human carcinogen, so it?s something to keep away from! Fluoride- Another human carcinogen, fluoride can have a myriad of unhealthy effects; from causing cavities to severely damaging your thyroid. Find out how using coconut oil could be the healthy alternative to supermarket toothpaste you never even thought of. Anti-dandruff shampoo like Head and Shoulders ?Dry Scalp 2-in-1? product contain methylchloroisothiazolinone, which is a suspected mutagen. They also contain ammonium laureth sulfate, which, although won?t cause any health problems on its own (apart from stinging if it gets in your eye), can sometimes be contaminated during the manufacturing process such as 1,4-dioxane. ?Early rat studies found that this contaminant causes cancer, and the U.S. Department of Health and Human Services has said it?s reasonably anticipated to be a human carcinogen as well. Can cause cancer in animals- so keep them well away from pets! This means it has been labeled a human carcinogen, but there is no sound proof that they are directly linked to one another. Spurs the growth of drug-resistant bacteria- yikes! Dr. Philippa Darbre, an oncologist at the University of Reading in the U.K., has published more than 30 research papers on those substances found in underarm deodorant and other personal care products. She says that many of these ingredients are concerning on their own. But the health risks of each may be greater?and more difficult to identify?when you consider the complex chemical cocktails that form when they combine. For example, her research has detected parabens?a category of chemical that acts as a preservative in some underarm and personal care products?in women?s breast tissue, though how those parabens got there and what happens when they are in breast tissue is unknown. Considered a ?possible human carcinogen?. So if you haven?t done it already, get to it! Ditch these common household products to prevent so many health problems that you could do without.